It’s hard to believe that it has been ten days since I arrived here. The first week flew by pretty quickly, and reflecting upon how much everything has changed is interesting. In just one week, I have fallen into a comfortable kind of rhythm and awareness of my surroundings. I’ve deciphered the bus schedule, navigated the city center, memorized the layout of my university, and even applied for my transportation pass. For one month and 33 euros, I can use the train and bus as much as I need, which will hopefully prevent me from putting all my money into getting myself to all the different places here. Europe is beautiful, but it’s expensive. To top it off, I plan on going to London for La Semana Santa (holy week) to visit Kaitlin. I think by that time I will be overdue for seeing a familiar face. The more her and I talk about it, the more excited I am for that time to come. We are going to see the Globe Theatre, and if we’re lucky, we’ll hopefully be able to catch a Shakespearean play. If not, we plan to catch one in a different part of the city. Apparently, there are theaters everywhere. I just need to book my flight, and I’ll get to see yet another part of the world. This week marked the beginning of orientation. On Monday, we had a general welcome from Miguelangelo, the director of international programs, and a “Buddy System” program, where we split into groups to answer questions. It wasn’t the most interesting thing, but I met some new people from all around the world, which was a golden opportunity. In my group, alone, there were people from Turkey, Africa, Mexico, Peru, London, and Spain; Talk about variety. In Oswego and Buffalo, the diversity level is almost at zero, except for exchange students from Asia. We made friends with three girls from Holland, and it truly opens your eyes to the different perspectives in the world. At one point, we were sitting in the auditorium, and I was just listening to the noise behind me. There were people speaking Portuguese, Spanish, English, and Finnish. Now how’s that for culture shock? It was essentially like someone tossed a bunch of different civilizations into one room and blended them all together. I was so happy to be apart of it. During a couple of programs, however, I got the chance to talk a little bit in Spanish. I will admit that my ability is still a little rough, but I can manage to string together conversation. Monday, I talked with someone from Mexico named Diego, and he told me that he was trying to improve his English. When he talked in English, however, it was incredibly proficient and made me a bit self-conscious about my Spanish skills. He assured me that I wasn’t terrible, which was nice. Then, today, I talked to two other people from Mexico, Lucas and Ali. Lucas didn’t speak a word of English, so I was translating everything that the lady was saying for him. He said that my Spanish was pretty good, and I couldn’t help but smile. It’s the small compliments like that, that diminish all my frustrations and assure me that I’m going to get better little-by-little. Unfortunately, today I was ill with a head cold. I came back from orientation and slept for five hours straight! Conchi, my host mom, came up to tell us about lunch, and asked me how I was feeling. When she realized I had a fever, she tucked me in and ran to the store to get me some medicine. I’m so incredibly blessed to have a host mom like her! She’s such a sweet woman. Hopefully I will feel better by tomorrow, because we still have another day of orientation and it’s Crystal’s birthday! I’d like to celebrate with her, so I’m going to try to get some sleep. On Friday, we have a trip to Toledo, and I’m pumped 🙂 It’s another city on my list of places to see, and I’m slowly chipping away at it. For now, I have to rest. Hasta luego! It’s starting to feel like this place gets better everyday. I know I already mentioned this, but the first day was immensely hard. With some programs the culture shock takes time to set in as you discover bit by bit what that culture is all about. With the Spain program, the culture shock is immediate, most likely because of the language difference. It’s like I was plucked from my roots and dropped in the middle of the ocean and told to swim. The first moments seemed hopeless, but with determination and appreciation, I know I’ll learn to fly. And that’s what I’ve wanted my whole life is to learn to fly. Today we went back to the city, and fue muy increíble! There is so much to do in the center of Madrid, and one thing is for certain: I am putting a ton of mileage on my sneakers. That’s because there are things to see, of course. 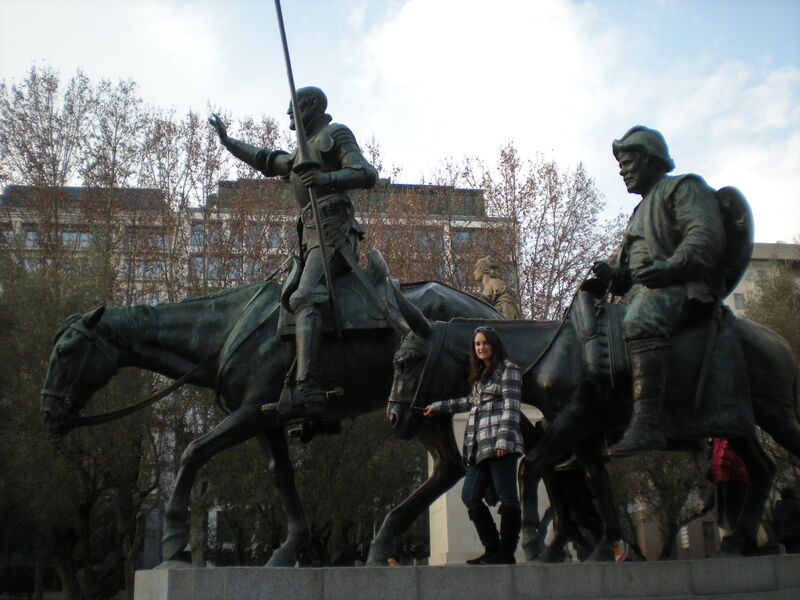 I think we stumbled upon el Parque del Retiro today, and there was a huge statue of Don Quijote and Pancho. After exploring some more and looking at the amazing architecture, Crystal and I ate our first Spanish pizza, which I might add was surprisingly good. We also went to una Chocolateria and had crepes with bananas and Nutella. It may sound a little strange, but it was absolutely fantastic. 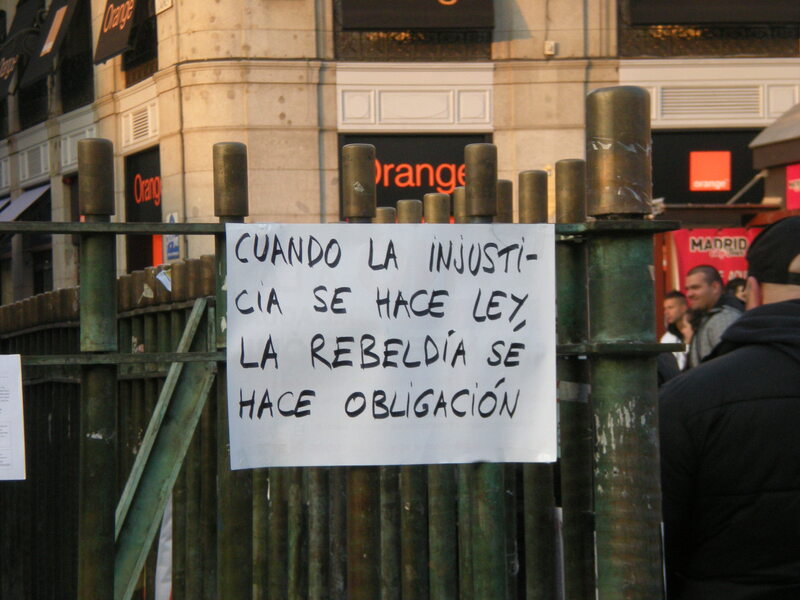 In La Puerta del Sol, we saw Madrid’s version of Occupy Wall Street. Yesterday, our program director told us that the movement actually began in Madrid in La Puerta del Sol, and though people aren’t camping out, they’re still angry. As many of you may know, Spain’s economy is in crisis. We hear about it at home all the time, and to many people in the States, it may just be another aspect of the news. Here, however, you can see the crisis. It’s even affected my host family, who once owned three furniture stores. Apart from just exploring the city, however, Crystal and I are getting used to living with a host family. Conchi, our host mother, is helping us a lot with just about everything. It’s still pretty difficult to express myself and say what I want to say, but Conchi and Marta are eternally patient. So far, I’ve asked them just about every question about the Spanish language that you could imagine. They always correct me but assure me that it’s just because they know I want to improve. I’m hoping that what people say about the language clicking after three months is true, because I would love that. After all, I’m surrounded by the language everyday so it should sink in soon. Necesito practicarla! I will admit, though, it’s nice to have Crystal to talk to in English. Tomorrow, we are going back to the center of Madrid, but with our group this time. We’re going to go to El Museo del Prado, and I’m pumped to say the least. I hope that it’s everything I’ve imagined and more. Conchi says that it takes four days to see everything the museum has to offer, but we’ll definitely get an overview. After an hour-long delay, an hour-long plane flight, a five-hour layover, another six-and-a-half hour plane flight, and a six-hour time difference, I arrived in Madrid tired but high on adrenaline. The site of Madrid city at night was incredible and breath-taking, and though I was nervous to meet my host family, I was excited undertake this adventure. From the airport, we had to take a subway, bus, and taxi to get to our house, and we nearly got lost after the bus. We had to track down someone to call the taxi for us. Hardly anyone we asked had a cellphone on them. That was certainly indicator number one that we weren’t in America anymore. When we got the the house, we thanked our cab driver and grabbed our things. The house is a earth-tone tan color that resembles a lot of what the houses look like in Arizona. Directly inside, there is a staircase that leads up to our personal apartment. To the left is my host parent’s room and to the right are two doors that lead to the kitchen and living area, respectively. Crystal and I have our own little living space on the second level of the house. We both have our own rooms and there is a living area with a television and a bathroom. Our host mother waits on us, which I’m not quite used to, and she makes us three meals a day and cleans our rooms and even does laundry. They are incredibly nice, but it’s difficult to communicate with them, and sometimes it can be frustrating for both parties. On day one, I experienced intense culture shock. I thought, wow I’m in a foreign country and can’t even speak the language well! It really helps to live with the host family though, because it forces you to practice! I’m hoping that I will start to get the swing of the language soon, because I want to be able to have a solid conversation. I have the basics, now I just need to adjust to the pace of the language, the accent, the slang, and having to to think extremely hard when I’m listening and speaking. You can never fully appreciate the power of language until you’re thrown into a situation where you can’t express yourself. Talk about eye-opening. The second two days were far less stressful. Monday we explored the city of Villaviciosa de Odon and discovered that there were more things to do in our little pueblo than we expected. There’s a Mercadona, or a grocery store, around the corner and some small shops and restaurants. In the actual city part of the pueblo, there are many more restaurants and places to go. The busing system took a little bit of getting used to and Crystal and I got lost many times. Now, we’re starting to get it. I also registered for classes and am taking photography, investigative journalism, translation, and Hispanic culture. Today, we went to the actual city center of Madrid, and words fail in describing its magnificence. We saw La Plaza Mayor, La Puerta del Sol, El Palacio Real, and so much more 🙂 In Madrid, there is a restaurant that holds the Guinness World Record for the oldest restaurant in the world. I thought that was pretty amazing. We walked around for hours just looking at everything and getting lost. The architecture took my breath away and the brick and stone roads enhanced the historic feel. You could sense the city’s past as you walked the streets, and that’s something you don’t get in America. ¡ Adios a los Estados! At this moment, there are five days left until I leave for Spain. Five days. That means I have five days left to eat my favorite foods. Five days to spend with my family and friends. Five days to make money. Five days to wake up in my own bedroom where I know every crevice on each wall. Five days to pack all my belongings into one suitcase of no more than 50 lbs. Five days to be comfortable. Five days to flow with the motions of everyday life. Five days until I plunge into the unknown. Five days. Now that’s a truly incredible thought. This semester abroad is probably the scariest and most exciting adventure that I have planned in my life. I’ve had a few people ask me, “Who would be crazy enough to pack up their stuff and move all the way around the world?” to which I usually just smile and smugly reply, “Me, of course.” This is exactly what I have wanted to do my whole life: go places, see things, travel the world from California to Japan. This is the one huge leap toward my dreams. I can’t wait to see El Museo del Prado and La Plaza Mayor, visit London and any other country I can afford, and most importantly, uncover a culture completely different from anything I’ve ever experienced here. ¡Dame adventura! ¡Dame perspectiva! I’m not positive that the full gravity of the situation has set in for me yet, but it’s definitely starting to. My family seems nice enough, from what little correspondence I’ve had with Gabriel. The couple lives with their 25-year-old daughter in a chalet with a pool and internet access. They seem nice, but I don’t know very much about them beyond a few tidbits of information. Quite reasonably, I’m a little nervous about living with complete strangers, but I’m lucky enough to have already met the girl I will be living with from Oswego. We’ve been texting and she definitely shares my enthusiasm and excitement. It’s comforting to know that someone will be going through the same thing as me. It’s also comforting that I have a friend from high school who is already there in Madrid, and she has great things to say about it. 1) Learn the language. Simply put, I want to learn to speak like a Spaniard. It’s not going to be easy, and more likely than not it’s going to be overwhelming and frustrating, but I’m going to do it. These are probably the two biggest goals I have for myself over there. Of course there are other smaller goals I have like to try new foods (I’m a picky eater) and to get good grades in my classes (eek fear of a bad GPA), but overall I’d say these two sum it all up. We’ll see how it all works out, of course. For now, I just need to focus on packing, paying the deposit for my housing, and saying my “see you laters.” I used to think of them as goodbyes, but a close friend once told me that is the worse possible way to look at it. I’m moving around the world for five months, but hopefully I can conquer the culture shock and home-sickness that is bound to knock me down at times. I’ll be thankful for Facebook and Skype during those times and, of course, my pen and notebook. Every other time, I’ll be scavenging the city and diving head-first into all that is Madrid.